The social media analytics provider quintly published an Instagram study of the average performance of Instagram profiles during the second quarter of 2015. The company reveals an growth of 17% on the average Instagram profile and 1.9% on Facebook pages. In the study, the social media analytics provider reported the first drop in Instagram Interaction Rates. To make the study applicable for every marketer it is clustered in different sized groups. To make the study easy to interpret quintly chose the most important metrics, such as number of posts, interaction rates, video and photo distribution and discussed the outcome briefly. Through comparing the outcome with Facebook statistics, the reader of the study can draw conclusions on whether it is necessary to adjust activities or not. 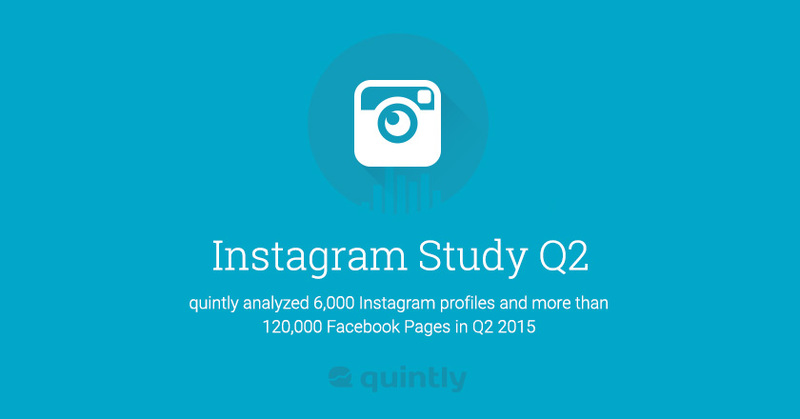 The social media analytics provider quintly gathered the data by analyzing over 6,000 Instagram profiles. By increasing the amount of advertising shown in user timelines, Instagram has taken a significant step towards improving the relevancy of its network, growing incredibly fast. This study is interesting for every social media marketer as interaction rates are considered to be significantly higher on Instagram than on Twitter or Facebook, now decreasing the first time. Knowing this and how brands are able to improve their activities in this channel is the ultimate goal of the study provided by quintly.